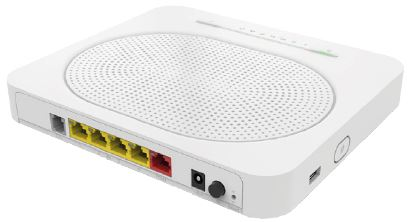 An optional purchase on our ADSL broadband packages is a Technicolor TG589vac v2 router. When purchased through Gradwell the router will automatically configure to use your account when you first plug it in. This article covers both initial setup and manual configuration if necessary. Once your broadband service is activated, unpack the contents and connect up as directed in the next section. Connecting your Technicolor TG589vac router is a simple process. First, determine what type of telephone socket you have. Most people have a standard telephone socket with one socket on the front. However, you may have a filtered socket which has two sockets (one smaller than the other). If you have a standard socket, then take the grey cable from the box the router was sent in and plug it into the smaller socket of a microfilter. A microfilter has two sockets, you can plug any telephony equipment into the larger socket if you need to. Now plug the other end of the cable into the grey socket on the rear of the router. If you are using any other devices in the premises in any extension sockets, please also ensure that these are connected using a microfilter to prevent disruption to your DSL service. This includes other phones, television boxes (such as Sky boxes) and fax machines. If you have a filtered socket, take the grey cable from the box and plug it into the top port of your telephone socket. Connect the other end to the grey socket on the rear of the router. Now use the yellow Ethernet cable to connect your computer to port one on the rear of the Technicolor. Finally, plug your Technicolor TG589vac router in to an electrical socket and press the black On switch on the rear of the unit. After around five to ten minutes your broadband connection will be ready to use - you should see a green Broadband and a green Internet light on the front of your router. 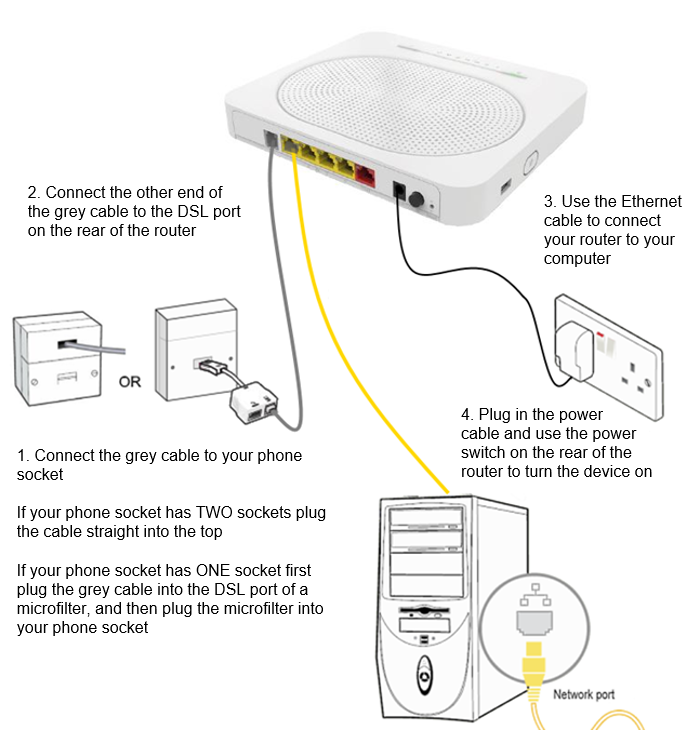 You can plug any other equipment into the other three available ports on the rear of the router (such as other computers, switches and VoIP phones). For details on what sort of IP addresses the ports will hand out to connected equipment please see this article. A card with this information on is also included in the box. From the WiFi setup screen of your chosen device, select the network name and then enter the wireless key to access the WiFi network. If for any reason you need to configure your Technicolor TG589vac manually, you can use the instructions below. From the dashboard, click Setup Your Gateway. Using this profile your router will be able to manage any additional public IP addresses that you have assigned to your broadband line. A device connecting to the router and requesting an IP address via DHCP will be given a 192.x.x.x address, however if you configure one of your devices with a public address from your pool then the router will recognise this and route traffic to it. You will need to know your IP allocation, which can be found in your welcome email or in your DSL control panel. This is assuming that you have already completed the Basic setup instructions above. If you have not already done this please go back and follow the setup instructions before proceeding. From the Setup my gateway page click show advanced at the top of the page. Now select Routed Subnet from the menu that appears. Select Enable Subnet and then click Save to refresh the page. Now enter your router IP in the Gateway Address box and select the correct subnet mask using the dropdown box. The Subnet ID, broadcast address and LAN IP range will be entered automatically.